Although the UK maybe small, it has a large capacity to surprise and excite – the charming traditional countryside, storybook beaches and fast moving cities create a glorious diversity while the nation boasts a miraculous history and heritage. If you think the UK’s main attractions are all about languid strolls in national parks with slate grey skies for company and the backdrop of green rolling hills then you couldn’t be more wrong. There is an abundance of things to do for the thrill seekers of this world, with the UK’s impressive array of theme parks offering ample opportunities for adrenaline junkies to get their fix. Drayton Manor in Staffordshire has been going since 1949 and is one of the UK’s most adored theme parks, with attractions such as Europe’s only standing rollercoaster Shockwave, Apocalypse the world’s first stand up tower drop and Maelstrom the only gyro swing to make you face outwards make Drayton Manor an unforgettable day out. The theme park is quite a family friendly park and even has a zoo with 15 acres of open plan zoo are home to 100 animals from all over the world including those loveable meerkats! Other exhilarating days out include Alton Towers – the UK’s most jam packed theme park – it is the most visited in the country and the ninth most visited in Europe due to its high number of white knuckle rides. There is also an onsite hotel and water park resort for those who love undertaking a nautical adventure too. Found in Chertsey, Surrey – on the outskirts of London is Thorpe Park. The nations “Thrill Capital”, it is the place to get your blood pumping in the UK with some of Europe’s most extreme rides and attractions. The UK is THE home of the beautiful game, and if you really want to immerse yourself in the culture of this football mad nation then take up the chance to visit amazing stadiums and soak up the magic of some of the world’s greatest grounds. Whether it’s the ultra modern and magnificent curved roof of Arsenal’s Emirates Stadium or the traditional brick façade of Aston Villa’s Holte End stand there is much to see and even more to learn. Even if you are not exactly a football fanatic a stadium tour offers an insight into the local area that would otherwise be overlooked, football clubs are entrenched in the local community and the history of the clubs offers an in-depth analysis of the region they represent as a whole. Newcastle’s St.James Park is home to some of the nation’s most football mad fans and once you go there you will appreciate the immense following the boys in black and white have. Old Trafford is home to arguably the biggest team in the world and walking around the terraces and seeing the spot where Fergie gives his hair dryer treatment in the changing room is an unbelievable experience. Edinburgh showcases all the best that Scotland has to offer, divine landscape, immense history and a riveting culture which comes to life during the superb fringe festival. Buildings and monuments are perched on a series of rocky hills and extinct volcanoes overlooking the sea - there are not many other cities in the world with a better a location. The old town’s charming line of buildings transport you to a fairy tale setting, and the Royal Mile which runs from the spectacular Edinburgh Castle down to Holyrood palace is the heart of this spectacular historical hub, containing many visible reminders of the city’s long past. Arguably the biggest arts festival on the planet, each August some of the world’s best comedians gather to perform at the Edinburgh Fringe Festival and the city attracts thousands of people looking to enjoy some 40 000 performances spanning across more than 250 venues! Although mostly dominated by comedy, the festival also caters for theatre, dance, physical theatre, musicals operas and music. Really justifying the biggest arts festival in the world tag! 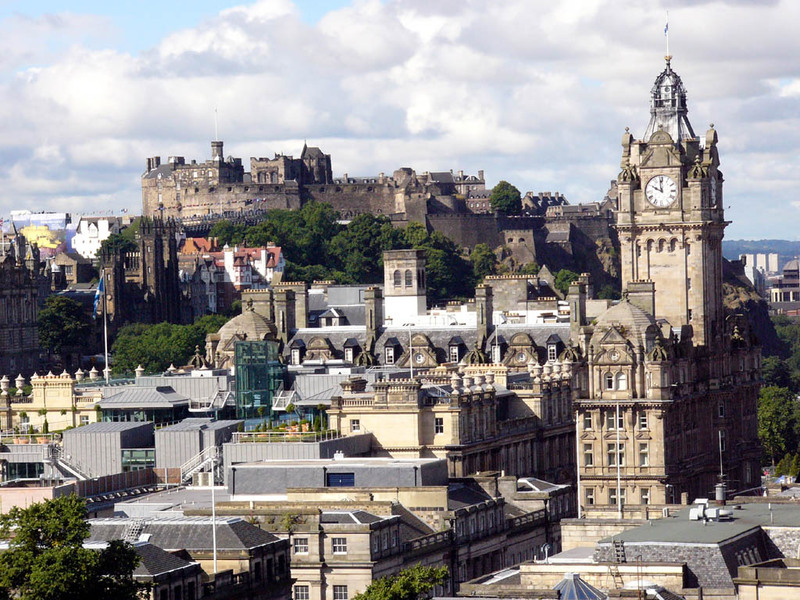 Edinburgh is a special city which embraces its fantastical setting and uses it as inspiration for some of the best cultural events that the UK has to offer. Believe it or not during the summer the UK does get a bit of sunshine…and within two minutes of the sun escaping the clouds you can bet that the nation’s beaches will be packed with the pale skins of those from Scarborough all the way to Aberystwyth. The British seaside holiday was popularised by the Victorians –and it has not changed that much today, with buckets and spades still offering ample enjoyment to kids while the classic seaside food of fish and chips, ice cream and candy floss still being enjoyed by many. The attractive promenades and piers which stand today are visible reminders of the long tradition of seaside getaways in the UK. For the quintessential seaside experience then head to Cornwall – the UK’s premier resort. Tucked away in the far west of the isle and with the longest stretch of continuous coastline in Britain Cornwall continues to be a favourite for many Brits, and it is not hard to see why with secluded coves, ancient market towns and awesome coastal cliffs. Blackpool is Britain’s most affectionately loved seaside resort; it is the UK’s second most visited town after London. With all the hallmarks of the seaside with amusements, a promenade while also having the legendary “Pleasure Beach” – an amusement and resort park with one of Europe’s best rollercoasters and the infamous Blackpool Illuminations - it is not hard to see why Blackpool is so fondly thought of. So when it’s not raining, get ready to enjoy the UKs best beaches! Simply put London is the greatest city in the world. The capital of England, the city is drenched with monuments from the nations fascinating past while also hosting an eclectic mix of culture and intrigue. One minute you can be walking through the alternative, quirky and Russell Brand lookalike filled streets of Camden Town and the next you can be passing Buckingham Palace using the iconic London Underground (which happens to be celebrating its 150th year). The great historical landmarks such as Big Ben, Westminster Abbey, St Paul’s Cathedral and the Tower of London are absolute musts but there are also a copious amount of impressive modern additions to the city such as The Shard and London Eye which has seen it surpass any previous held notions and was part of the reason why London hosted the 2012 Olympics. With so much packed into one city it is hard to know where to begin – a vibrant art and culture scene is dominated by creative theatrical innovation, contemporary art, pioneering music, writing and design. But one of the most special and unique aspects of London is the fact that it truly is a cosmopolitan city, over 300 languages can be heard spoken throughout the city and over a third of its population have come from overseas and today it truly is a multicultural city. Ride the red buses and witness at first hand why London is such a marvellous place. From the green hills of Scotland to the sandy beaches of Cornwall there is so much to see and absorb that you will find yourself pleasantly exhausted after seeing all the delights on offer. The diverse landscape is only matched by the wide spreading cultural sights whether it be the impressive architecture of London or the rustic Blackpool seaside.